The Mimesis Art Museum, located in Paju Book City near Seoul, was built by Open Books between 2006 and 2009 and named after its art imprint, Mimesis. It is a truly amazing building, both inside and out, that renowned Portuguese architect Álvaro Siza took more than seven years to design. Fellow architect Carlos Castanheira, who worked on the project with Siza, writes in the book Álvaro Siza: The Function of Beauty that the design for the Mimesis Art Museum is actually a cat. The book, published by Phaidon in 2009, displays sketch studies and pictures of the museum under construction. 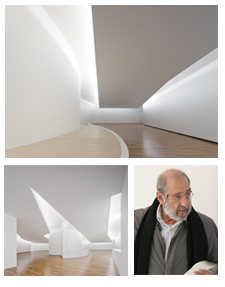 The building was built jointly by Álvaro Siza, Carlos Castanheira and Korean architect Kim June-sung. With three floors, a basement and a total area of more than 3,600 square meters, the Mimesis Art Museum offers an expansive exhibition space as well as administrative and office areas on the mezzanine. On the inside, white and wooded surfaces are lit by indirect, natural lighting. On the outside, light grey, exposed cast concrete emphasizes the feline curves and sharp angles of the building. The Mimesis Art Museum presented its first art exhibition to the public in 2012 and has since then hosted various exhibitions and events. You may have a look at pictures of the building that were taken by photographer Fernando Guerra via his website. For more information about the Mimesis Art Museum, please visit the Mimesis website.